"Ah! The next world, the next world... Do not make me laugh with that! The world, it is the world. There are not lots and lots. Only, there is the world above and there is the world below. And sometimes, everything is turned upside down. And that is all !" Margot, the Tale of Alleuze, 1994. The following pages are devoted to the reading of the site of Alleuze carried out by Alain Freytet. In its landscape study for the development of the site, within the framework set out by the Municipality, he presents a preliminary draft of installation for the site and the village, after having outlined his personal vision of the place. You will find here a reflection of his study, in the form of extracts. Alain Freytet is a landscape designer (Address: 26, rue de l'Eglise - 78720 La-Celle-les-Bordes - FRANCE). All the texts and the illustrations which follow are from his hand. The World Above is pleasant, inhabited, it is the field of the cultivated Planèze [local name of the high plateau] and its villages. The World Below is composed by the funds of small valleys and by the throats of Truyère, occupied in their bottom by the Grandval Lake. Between Above and Below, one finds coasts of moors or wood, small valleys and spurs. In the part below, there is a presence which points out the World Above: the platform of the Saint-Illide church: this is the above-below. At the bottom, rising towards the World Above, the rock and the castle of Alleuze remain by nature belonging to the field of the lower part: this is the below-above. 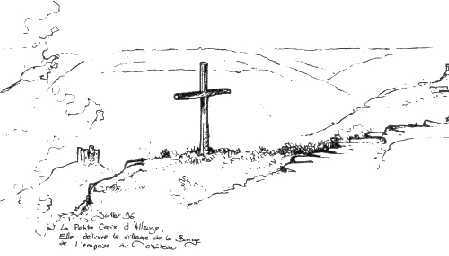 The Cross of Languiroux d'Alleuze. Sketch by Alain Freytet. Vast, the planèze extends to the horizon, already announcing the landscapes of the Cézallier. In the distance, the heavy spine of the Margeride is covered with a dark forest. Great undulations of meadows are punctuated with tortuous Norway pines and ashes with enigmatic silhouettes. All here seems worked, carefully cultivated. Only some small valleys escape this land utilization. The road curves in these vast wide areas. Abruptly, it rocks and opens on the depths of the throats of the Truyère River, at the bottom of which the Grandval dam is spread out. The small white cross of Alleuze seems to entreat the evil which could assemble from these depths. Another place offers this abrupt swing of the cultivated plateau towards the valley of Alleuze: the pine forest of Languiroux. Giving up the great pieces of Languiroux, the path is inserted in timberings which announce the Wood of Combeyre. With the change of incline, the pines are spaced and soon, framed between the salmon trunks, the castle of Alleuze, more alone than ever, imposes itself on the glance. It is put in scene by the V profile of the small Bastide valley beyond the Grandval Lake. 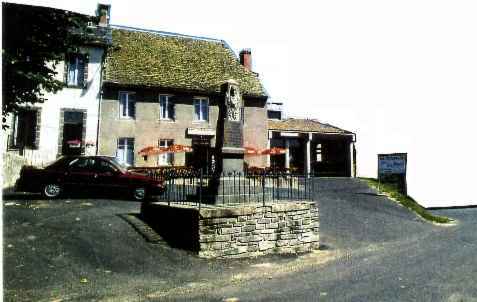 Contrary to Languiroux, the village of La Barge is settled at the very edge of the plateau. It dominates the valley of Alleuze, partly covered by the waters of the Grandval dam. It is established on a projection tightened between the small valley of La Barge and the coasts of La Barge. The relief which surrounds it seems to have influenced even its name, Barga meaning the slope, and become "La Barge". The end of the village, as a figurehead, draws a narrow platform on which a vault and a martyrdom are built. 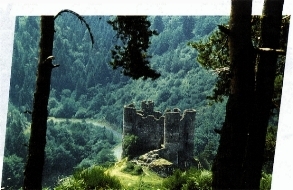 As the bird engraved on the gate of the vault, here one flies over the valley where the castle of Alleuze hides, threatening. 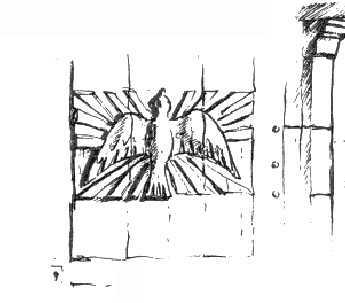 The bird on the gate of the Vault of La Barge - Sketch by Alain Freytet. Alas, some objects break the charm of this intimate discovery: a dustbin container, an electric post, a brick barbecue or a barb gate made with corrugated sheet. Everywhere, stone walls, often decorated with rupicolous plants, seem to connect the houses the ones to the others. They often ensure the fixity of the grounds and compose, in this bumpy relief, ledges and levels where houses, paths, streets and gardens are fixed. "We are here in the deep heart of the enthralling mystery which haunts the dark site of Alleuze... You will be soon, dear listeners, on line with this innocent small village of La Barge; this good old French hamlet, nested in the greenery, overhanging the worrying ruin of Alleuze." From the Tale of Alleuze, 2nd edition, 1994. In the top of the village, a square takes shape, hardly crossed by the road which seems to widen at this place. It is tallied by the town hall, the restaurant and of the farm buildings. A very beautiful barn, stretched in length, seems to be used as a bodyguard by the village, above the small valley of La Barge. It limits the space of the square of the village. Barn in La Barge of Alleuze. Sketch by Alain Freytet. Two war memorials are facing each other with the same stones and the same proportions. As much as one is leaned and accompanied, in particular by a cut lime, the other one is lost in a oil slick of bitumen. The Mallet monument does not take part in the composition of the square of the village... Photograph by Alain Freytet. Associated with the town hall, the old school is identified today only by the presence of the old courtyard and the toilets. The old court, bituminized and encircled with thick flowers stands and a rusted netting, is sad. The hopscotch has been erased on the ground. Beside this, a café restaurant animates the square and gives it all its significance. Below the place, on the pinion of a house, an accumulation of advertising rusted boards holds the attention and masks what makes the charm and the landscape value of the village.